Local bowler Nicky Brett is the new national indoor two-bowl singles champion. Carrying the colours of the Huntingdon club, the former world champion from Yaxley defeated Dorchester’s Martin Puckett 21-17 in the final at Nottingham. In the same event, Stamford-based junior international Stephen Harris, who plays out of the Spalding club, reached the quarter-finals, where he was beaten by Puckett. The women’s equivalent also came to the area with Spalding’s Chelsea Tomlin beating Riverain’s D. Cooper 21-12 in the final. 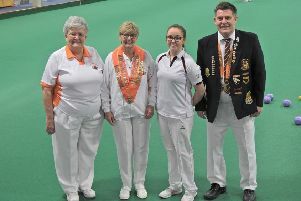 There are hopes for more national success at the same venue over the next week with local bowlers involved in the last 16 of five different competitions. First up on Saturday is the men’s over 60 four from Stamford – Malcolm Cullingworth, Tony Scarr, Trevor Collins and Jeff Newson – who face a quartet from the Sussex club Adur. Then on Monday, the Stamford club are represented in both the men’s and women’s over 50 triples. Bob Warters, Cliff Watson and Keith Rippin face North Wilts, while Sue Moir, Jan Want and Chris Ford play West Denton. There is also local representation in both the men’s and women’s over 60 pairs on the Wednesday, with Peterborough’s Liz Hext and Sheila Craig in action against Newark, while the opponents for Stamford’s Malcolm Smith and Martyn Dolby are yet to be confirmed. In the Cambs Seniors League, Whittlesey and Peterborough & District shared rink honours and the points following a 68-68 tie. There were wins for host club rinks skipped by Bob Burbridge and Dennis Pinshon, while Rod Maplethorpe and Mick Linnell responded for Peterborough, who remain sixth.